There are now new one hundred different models of convertible standing desks on the market, and we’ve lab-tested dozens of them. We asked our staff experts to put together this guide to make the shopping process easier by helping you narrow down the select few that will work best for your particular needs. What type of converter should you buy? There are many ways to convert your fixed-height desk into a sit-stand workstation, from stacking your laptop on top of a cardboard box (don’t do that) to electric risers that cost upwards of $1,000. The most popular solutions are Z-Lift and X-Lift converters, like the Ziplift+ and Flexispot. They’re popular for a reason—this type of converter blends versatility, ergonomics, and affordability. 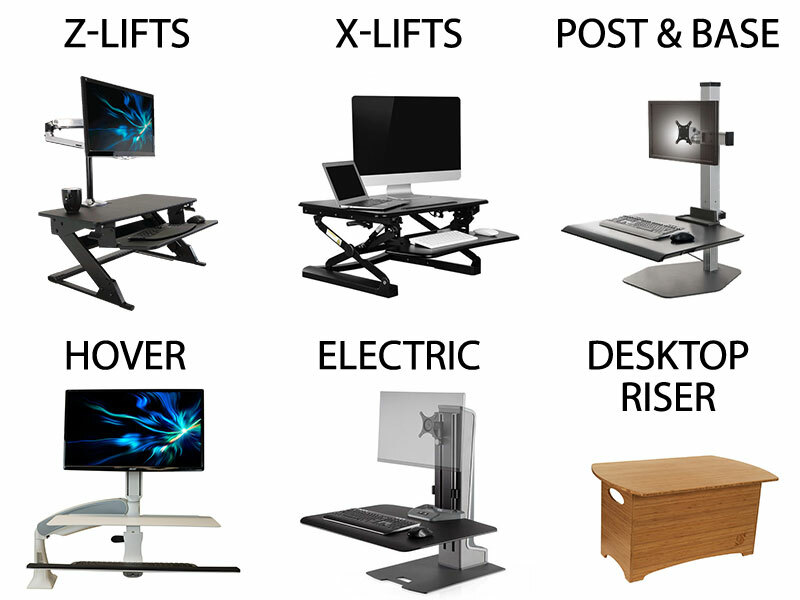 See our standing desk converter comparison review for more info on all six types. How high does the work surface raise? How low does it descend? Nearly all convertible standing desks, except for desktop risers, have a height adjustment mechanism for changing work surface height. The range of the work surface is an important factor to consider, especially if you are a taller worker. Many height ranges cap out where a 5’10” user is comfortable. Other units better accommodate taller users. Some converters, especially Z-Lifts, have ‘dropped keyboard trays’ that rest lower than the work surface. This means you don’t have to raise your monitors as high to reach an ergonomic viewing position. They rest on the back of the work surface, which is several inches higher than the keyboard tray. The less distance your monitors need to be raised, generally the more stable they will be. What are the dimensions of the work surface? Is there room for you to type and mouse? Finding a balance between a roomy and slim work surface is a challenge. There’s space for personal preference here, but you want to be sure your keyboard and mouse fit with room to spare. And by the same token, you want to be sure the design of the work surface allows you to move your hands from typing to mousing with the least amount of movement possible. Does the keyboard tray tilt to a negative angle for a more neutral typing posture? Not many convertible standing desks offer this feature to date. But typing at a declined angle requires less strain on your wrists and arms than otherwise, especially in the standing position. It more closely resembles the ‘floating astronaut’, truly neutral ergonomic posture. How much does the unit shake while you type and work? Some types of converters are inherently more stable than others. Z-Lifts for instance are some of the most stable of the bunch. Many others offer comparable stability, depending on the model. Shaking of the work surface is problematic from a couple different standpoints. First, with the monitors moving, it is difficult to focus on your screens and do your work. Second, with the keyboard platform moving, typing can be a challenge. 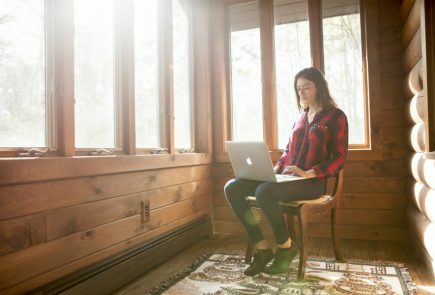 A shaking keyboard platform can lead to pressing down the keys with more force in the effort to gain stability, and this can lead to strain on the wrists, and also a spring-back effect when you let up the force and stop typing, which can cause you to have to resituate your hands and refocus. Can your monitors pan, tilt, rotate, or change focal depth? Do they have their own independent height adjustment mechanism? Most ergonomically adjustable converters allow your monitor(s) to pan, tilt, rotate, and sometimes even change focal depth. This flexibility gives you the ability to keep your screens at the right distance and angle from your eyes. A rule of thumb is to keep your monitor about an arm’s length away, and tilted back slightly (about 10 degrees). The technical reason for this ~10-degree tilting has to do with the fact you want your screen the same distance from your eyes no matter what section you are looking at. There’s a longer distance from your eyes to the bottom of the screen (think about the hypotenuse of a triangle), so tilting it in equalizes the distance from your eyes to both points. This makes for less strain on your eyes during the day. The very best standing desk converters enable you to move your monitor(s) up and down separately from the work surface. This gives you the flexibility you need to keep your screens at an ergonomic viewing position – no matter if you’re sitting, standing, or ‘perching’ at a height in between. Proper ergonomic position is such that your eyes look at the top of the screen straight ahead, at about a 0-degree angle. Is your converter’s mounting method VESA compatible? What is the maximum monitor size it supports? The standard way to mount your monitor(s) to your converter is through a VESA compatible mount. Nearly all converters have VESA compatible mounts and most monitors are VESA compatible as well. 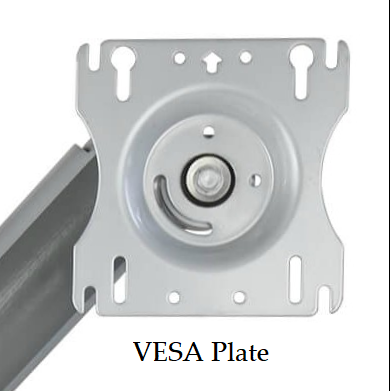 VESA (Video Electronics Standards Association) sets the standard for mounting monitors, TVs, and other displays to stands or wall mounts. It’s important to check your monitor(s) and converter both to make sure they can connect to each other. Some converters, especially multiple monitor models, have limits on the size of monitors supported. If you plan to mount multiple monitors, you’ll want to make sure that your converter has space to attach them. How easy is it to set up on your desk? Generally, the easier to assemble and install the better. Many of these devices require tools to set up properly on your desk. Some require more than one person. If the process is too complex, it can make for a frustrating customer experience. One thing to keep in mind here is the weight of the unit. For heavy converters, you’ll need assistance lifting them onto your desk. Are the component parts durable? Is the design structurally sound? A basic but important question to ask. Cheaper plastic parts will not last as long as their higher quality competitors. Imported, ‘knock off’ converters with short warranties should be avoided. Fortunately, sit-stand desk converters with ergonomic features are becoming more and more prominent. By all appearances, it seems manufacturers are paying more attention to the way their products interact with users’ bodies. Note the vertical distance between the worker’s eyes and the top of his monitor. This is a perfect example of how NOT to set up your workstation. Your line of sight should extend in a direct horizontal line to the top of your monitor, minimizing strain on your neck. It’s more common now, for instance, to see post-and-base converters with independent monitor height adjustability, meaning the work surface and the monitors move up and down individually. This feature caters to a basic fact stemming from our individual anthropometries: most people need more space between their keyboard and monitor when they’re standing than when they’re sitting. Yet many older products were not designed with advanced ergonomics in mind. 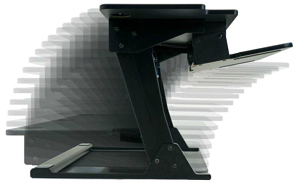 The original Z-Lift standing desk converter, the Varidesk, could not accommodate a monitor arm at all. 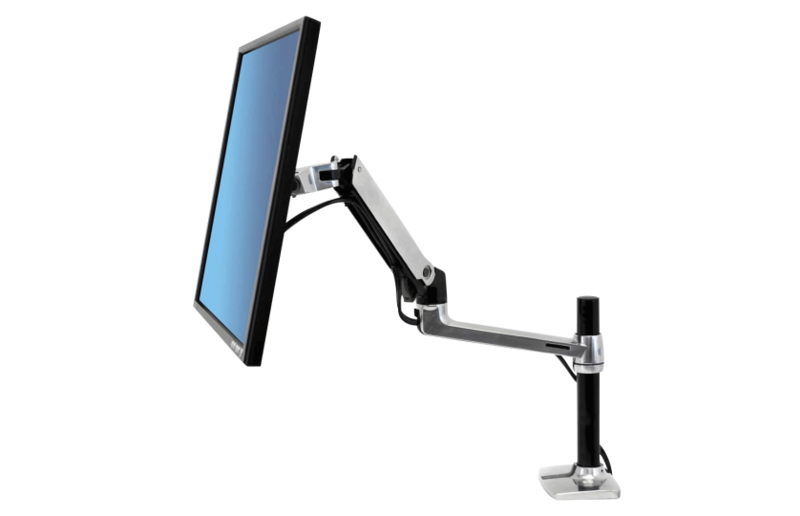 A monitor arm is a key accessory that allows a Z-Lift converter to raise your monitor(s) up to a proper ergonomic level, so your eyes line up with top of the monitor at a 0 to (-)15-degree angle. 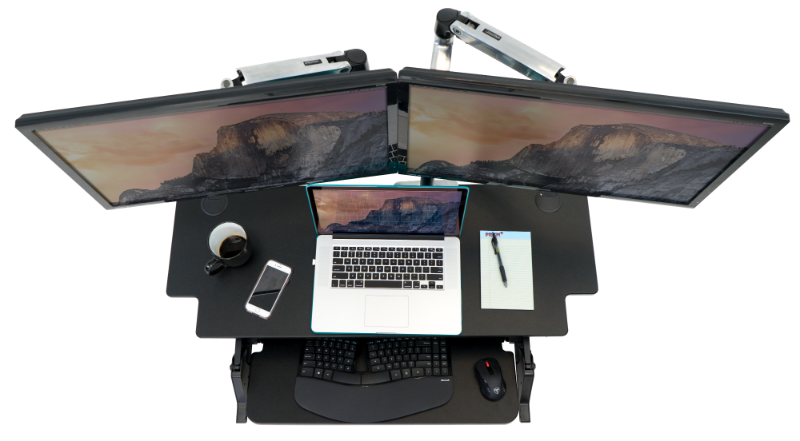 Varidesk has since added a special line of monitor arms that fit their products, but conventional monitor arms still won’t attach due to a bar in the back that blocks the clamp. Some manufacturers, perhaps in the efforts to cut costs, stubbornly continue to ignore ergonomics, and very often end up producing products that may cause as many ergonomic problems as they purportedly solve. The effort it takes to find a device that suits your individual anthropometry (the unique dimensions of your body) will help keep your body healthy in the long term while you stand and work. Over the last few years, we at WorkWhileWalking & WorkWhileStanding have tested the good, bad, and the ugly – all standing desk converters under the sun – and we’ve come to this conclusion: the best are a rare breed. The trouble is finding one that marries quality with top-rate ergonomics. That may sound like a simple formula, but you’d be surprised how many options out there fail the most basic tests. See our Standing Desk Converters Comparison Review for our ranking of the top models.